In December 2016, german graphic designer Matthias Hübner pitched for the new visual identity of the IKOB, a museum of contemporary art located in Eupen, Belgium. Part of the pitch was the commissioning of a custom typeface, which was planned to be released as an open source license, once it was finished and in use. 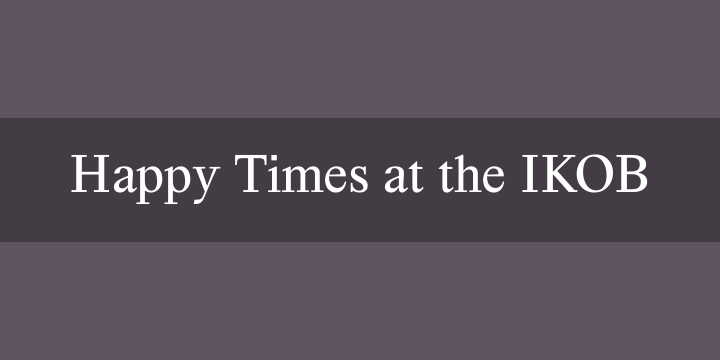 I was asked to design this typeface as a contemporary rendition of the Times New Roman in two cuts: Regular and Italic. Since the typeface couldn’t be ready for the relaunch of the new design, Matthias decided to do a typographical restart: all communications (Posters, Flyers, Letters) were set in Times New Roman, and this typeface would be replaced gradually with new sets of characters as they were produced. At the end of 2017, the whole set was finally developed and in use ever since. 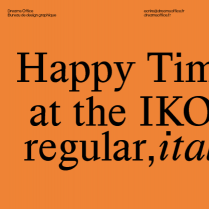 With some minor tweaks and corrections, the typeface will be released as of now under the title: Happy Times at the IKOB.